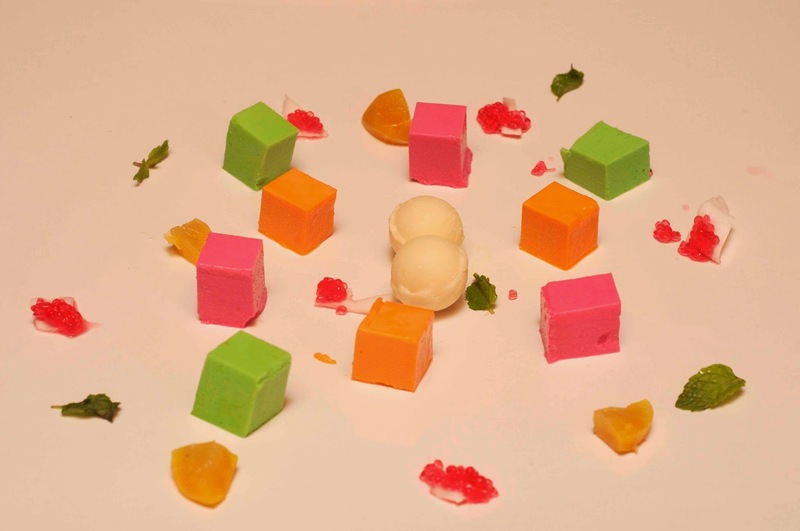 To dessert hop, wolfing down four of what we thought were the best desserts in Chennai's hotels. We narrowed it down to the Tiramisu @ Focaccia, Hyatt Regency, Chocolate cake @ Taj Mount Road, Miss Mini @ Pan Asian, ITC Grand Chola and finally Macarons @ EST, Hilton. We were well aware of the possible sweet overload, but decided to try it anyway. Disclaimer: Try it at your own risk. 2 of the 5 planned partners in crime pulled out, so we decided to drop Taj Clubhouse and 3 of us went around the other three places. Why is Part 2 coming ahead of Part 1? Chef Vikram. Thats the reason. Nothing more, nothing less. Now, what happened that night? The night was going well with a great start at Focaccia at Hyatt and that will come in Part 1. 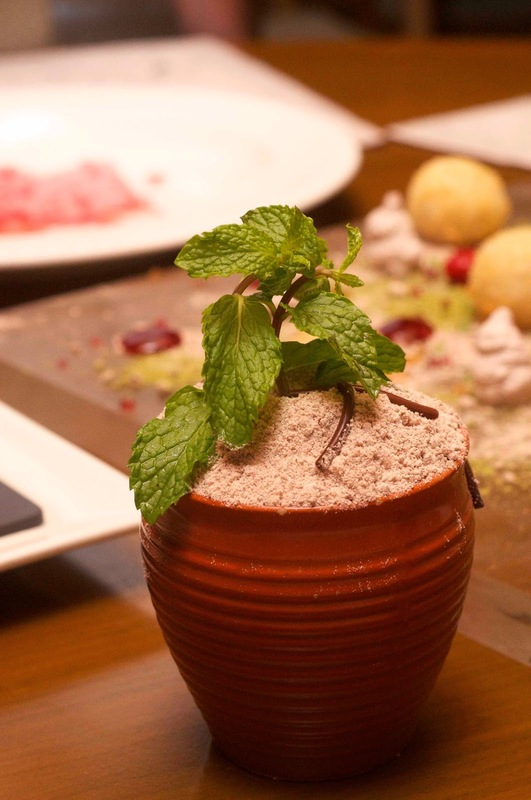 We then drove down to ITC, walked into Pan Asian and met Chef Vikram and told them that we are doing the dessert hopping and that we wanted to try his Miss Mini, the completely edible chocolate dessert that is on his menu. "Won't you guys have a sweet overload?" he asked. "Yes, chef. We are well aware of that, but we decided to take the risk," we said. "OK, I'll make the Miss Mini, but I'll also give you a dessert round that won't give you the sugar rush," he said. 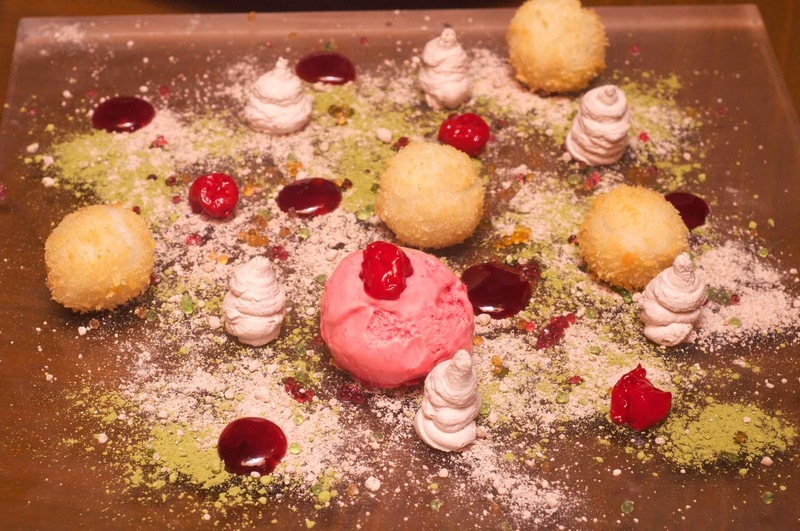 "We already had two dessert at Hyatt, so we don't want to go overboard," we said. And he brought a little plate. 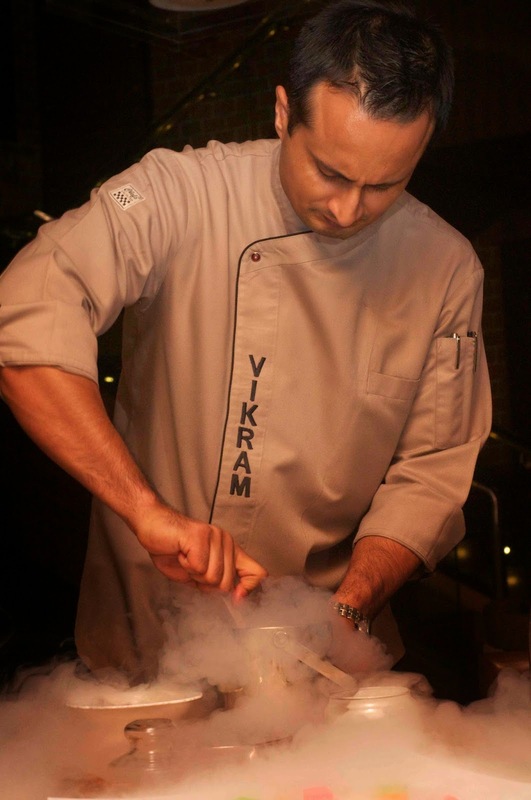 It had a pink powder on one side and he was pouring a pink gooey liquid on the other side and when he was making this pink gooey liquid, I got, what I think, is a great photo of Chef Vikram. 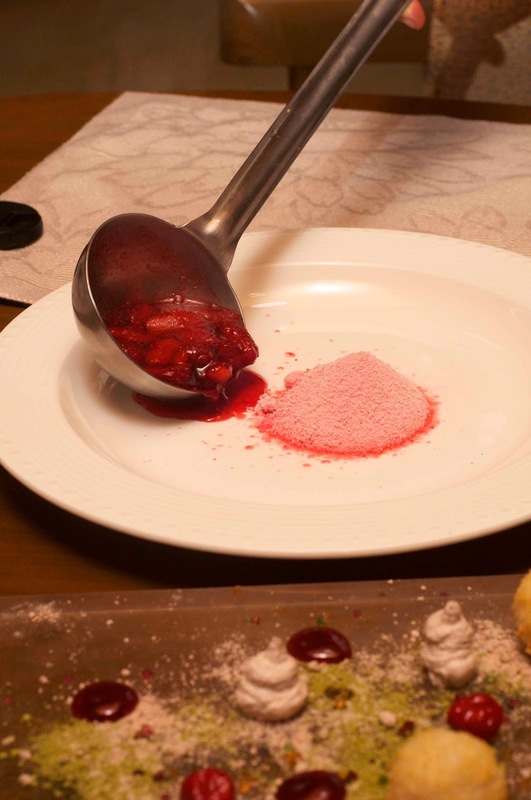 "So, guys, this is Strawberry at -63°C he said pointing to the powder and this is strawberry at 63°C," he said. We dug our spoons and the results were bliss. At 100° apart, the powder and the goo, with exactly the same ingredients confused our brains. We were laughing, we were high! And then he brought another dish with banana and another powder. My tongue knew exactly what the flavours were, but my brains didn't. It was familiar, yet unfamiliar. It was confusing, yet comforting. And then he revealed it. It was Nutella. Of course it was. No wonder my tongue knew it, loved it and gulped it down. It was powdered. How did that happen? 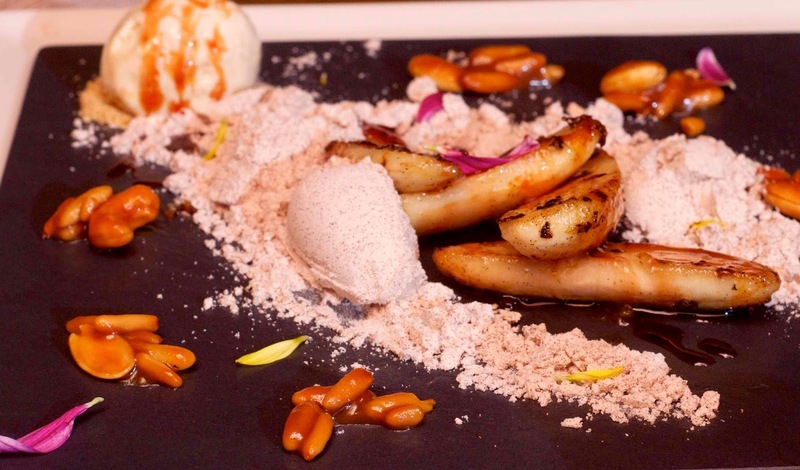 Of course, Chef Vikram cannot serve you regular banana with Nutella. He has to mix some liquid nitrogen, add maltodextrin, add a cup of Einstein to it and top it off with Newton. And serve it with Leonardo da Vinci. 8 years of medical education was easier to comprehend than how these chemicals powder Nutella without altering the flavour. Nobody taught me that in Chemistry classes in school! Maltodextrin does this to food, it seems. My foot. He does those things to the food! And then he served our simple 'Water Chestnut in Coconut milk,' molecular gastronomy style. The flavours were there exactly how they are in the original dessert, but of course, you can't see it. The plate with multi-coloured blobs, yes, that was it! "Dessert time," he announced. What? Dessert? Again? He brought two scoops. One was white and the other was green. I scooped the white one and it went in, smoothly. "What's the big deal?" I was beginning to think. And then the big deal revealed itself. Chef was laughing as I came to terms that this so called ice cream was white pepper. But how did the white pepper taste come to the tongue after the ice cream blob went inside? Oh yeah, after taste. I even forgot things like that. "You almost wrote me off, didn't you?" he asked. He couldn't control his laugher as the spice was hitting us. "Try this," he said, offering the green 'ice cream'. Of course, I was better prepared this time. I scooped a spoonful and tucked in, waiting for it go to the tummy and bring back that after taste! Chef Vikram got the better of me, again. While I was expecting an after taste, this was so full of flavour and yet, I couldn't place it. It hit me straight away. It was back to tongue-knows, brain-doesn't. This was full of flavour, a flavour that I love and a flavour that I haven't had in its perfect avatar for a long long time, but yet, again, my brain was confused. My tongue was relishing it! And then it hit me. It was guacamole! Perfect, perfect guacamole in an ice cream form. Oh yes, we had the Miss Mini too and it was divine and the entire dish, including the jar is edible, but anymore confusion and I would have thought Earth was Mars. When I woke up from the trans in the car, the previous dessert and as I found out later, the subsequent ones paled in comparison. The bigger problem; I ate chapati at home and my brain thought it was dosa for a bit. I ate a chocolate and my brain was waiting to 'see' if it was something else. It took my brain 3 whole days to properly recognise flavours again. Chef Vikram runs Pan Asian @ ITC Grand Chola and for me, it is one of the best restaurants in the country, if not the world. I have been to ITC Grand Chola five times now, but have never been to any other restaurant in that property. It houses the legendary Peshawari and apparently a great Italian restaurant too, but Pan Asian is magnetic! The hotel can have 200 restaurants and unless there is a greater force using some scientific principle like Newton's theory and Earth's magnetic field or something equivalent to how maltodextrin powdered Nutella, or maybe even Black magic, I don't know how and when I am going to try any other restaurant in ITC Grand Chola. A meal for two will cost you about Rs. 4000 and the chef's tasting menu which is a 13 course meal is your best bet to cover the entire menu without bursting your pocket or your stomach. Oh, the restaurant was almost packed on a Tuesday evening, so clearly, people are willing to pay for good food in Chennai!